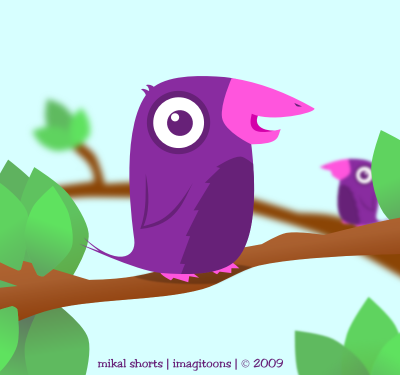 Welcome to the Imagitoons Zoo Aviary!! Our first stop brings us to the small purpala (perp-all-uh). These birds perch on small branches and sing nearly all day long, stopping only for a meal of bugs. They really like to stay in groups - in fact, it is very rare to see a lone purpala. Purpalas have naturally purple feathers and pink beaks, which makes them easy to spot in the wild. These aren't your average everyday backyard birds - if you ever do see one in your backyard it's probably only because they are in the middle of their bi-yearly trans-continental worldwide migration which no one is really sure why they take! Let's keep moving along, there are a lot of interesting creatures in our aviary! !